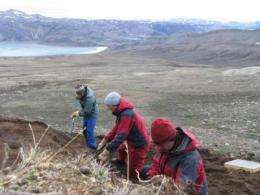 From left to right, Ashley Ballantyne of the University of Colorado at Boulder, Dara Finney of Environment Canada and Natalia Rybczynski of the Canadian Museum of Nature search for fossils in a peat deposit at Strathcona Fiord on Ellesmere Island in Canada's High Arctic. Credit: Photo courtesy Dara Finney, Environment Canada. The last line of evidence put forward by the CU-Boulder-led team was a comparison of Pliocene ancient vegetation at the site with vegetation present today, providing a clear "climate window" showing the overlap of the two time periods. "The results of the three independent temperature proxies are remarkably consistent," said Eberle. "We essentially were able to 'read' the vegetation in order to estimate air temperatures in the Pliocene." "Thus current levels of CO2 in the atmosphere of approximately 390 parts per million may be approaching a tipping point for irreversible ice-free conditions in the Arctic"
"The vast majority of climate scientists agree Earth is warming due to increased concentrations of heat-trapping atmospheric gases generated primarily by human activities like fossil fuel burning and deforestation." Well... just a guess, but I suspect that any good dictionary would give you the answer. Irreversible in this case represents a state change. To move back would require CO2 levels MUCH lower than todays. While your dictionary is open, check out the definition of 'tipping point'. Are you a scientist? I know that there are a few that believe that global warming doesn't exist, but they get fewer every day. There are scientists that believe in creationism too... but most don't. Um...Joefarah? There are more than seven or so climate scientists on Earth, so "everyone who isn't John Christy, Richard Lindzen, Roy Spencer, or Fred Singer" does, in fact, qualify as a vast majority. But that aside...very interesting, and quite worrisome, as well. One thing strikes me, though; these temperatures are measured over the period during which North and South America finally joined together, cutting off the Atlantic from the Pacific. I know that even five million years ago, the gap between the two continents wasn't exactly very large, so I'd be surprised if there was much of a current through the passage--but if there was, its presence might've had some effect on global climate, and perhaps enough to explain some of the high temperatures around Ellesmere island. It'd be very interesting to try to put together a similar record for other northerly islands, and see if the same temperatures existed there, as well. They predicted that @400 ppm the high arctic would warm up 19 degrees Celsius? Not a smart move. This CO2 concentration level would be reached in less than ten years then, they would find themselves subject of ridicule. He might fail as a scientist, but he'd be a hell of a used car salesman...or perhaps a game show host. 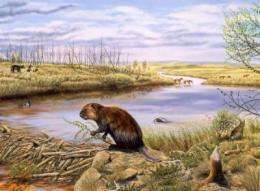 "Ellesmere Island is the only reported Pliocene fossil site in the High Arctic to yield vertebrate remains"
This site is not typical. Another example of climate whackos cherry-picking data and using unforgiveably small data sets to make excessively broad claims. You can't sample one unique site and use questionable methods to estimate historical temperatures and then start making predictive inferences relating to conditions present today. That's just stupid. Sounds to me like they are more interested in stopping the coal mine than anything else. This smells like a manuever to influence the government in regard to the mining. Actually, this could be a good thing. Poles warming, plus more rain... Voila! More farmland! How did the planet recover after the dinosaur where wiped out by a comet? Could the melting ice caps have to do with the increase in sun spots? I have not seen a report that looks at everything in a big picture. Most astro-physicists believe that the sun plays a major role in the climate we experience here on Gaia. But then, they are classical trained, unlike the modern crop of pseudo scientists in the climate change aka give me a grant dissipline. This site is not typical, it is an outlier, and should be rejected. The over hot ocean is due to the ubiquitous petroleum oil present in the surface marine micro-layer. This oil reduces water evaporation and thus heats the oceans. The released fresh water from ice melt and the over-hot ocean will precipitate an Ice Age. I couldn't have said it better myself. I still say that the real point of the story is the coal mine though. They are trying to say that peat deposits should be protected. Oh, and it just happens that peat and coal are geologically related, since peat can turn into coal. It's common to find peat and coal nearby one another. So, by saying that the peat should be protected and setting a precedent for this, they can block a lot of future coal mining. There's an agenda here, or else they wouldn't have mentioned the mine in this "scientific" (read non-scientific) article. About 90% of the climate articles on this site are politically motivated with some agenda other than science. My BS detector goes nuts every time I read one of these. Your point about the connection of north and south america is a valid one, and upon looking it up, seems to be a well-known and well-established fact. I wonder why the supposed experts who wrote this article failed to mention shuch an obvious factor which would have major impact on the interpretation of their observations. The sources I found say that the connection of the panama isthmus cut off the equatorial current and caused the Atlantic to cool drastically in a short time, leading to the glaciation of North America, Greenland, and Europe, as well as the polar ice cap formation. So, it looks like you were spot on about that, and the people writing about the coal mine are a bit confused about a thing or two. lol. It's also well known that a group of stars passed relatively close to our solar system around that time and it's likely that there was at least one supernova in that group around this period of time. Such a nearby supernova would have had effects on our climate due to destruction of our ozone layer and other effects. I would think that a climate study like the one above would take that into account. There was a marine mass extinction, probably caused by the supernova, but who knows for sure. I would suspect that a massive decrease in algea and other marine plants would have a prety big effect on CO2 and O2 concentrations, but I'm no scientist. I just hate it when clowns like this Ballantyne character make serious climate scientists lose credibility by publishing this kind of junk. Don't you agree that such an obviously flawed paper hurts more than it helps your cause? It makes you look like idiots by association, just like when Tegiri posts something that agrees with me. There is no such thing as a serious climate scientist. In fact climate science is an oxymoron. You can't have a science about something you don't know anything about. These liars can predict what the weather will be in two weeks and they want us to believe they know is going be 36.0796543 degrees celcius in 100 years. Freeman Dyson. A majority of one. He actually worked as a Climate Scientist. His specialty is combining data from many separate systems. He is the world's supreme multi-disciplinarian. You fear-mongers (that's what Dyson calls you) know that, yes? Cannot stand the truth, oh giver of the blatant 1? And Dyson's a lefty as well. Though an honest one. It's strange, but it seems like interest in these warming studies have really cooled off of late. Could it be that fad science is moving on to new pastures? Insanesciench: Recent papers showing that GW is stronger than predicted. I can only assume you are typing this misleading sentence to influence those who might not be paying close attention. Of course, you might not be paying attention and might not know what is actually happening. Let me be more specific. They now have multiple satellites showing that we have a net annual loss (moving average) of ice on the planet. They also have new methods for assessing ocean temperatures that are showing the steady enthalpy increase in the ocean water column down well below where it was expected to be increasing by now. They have reconciled surface and satellite measurements of temperature to the models. Now they are working more on the assessments of prehistoric temperatures (reducing the uncertainties). And, contrary to what I am sure you have heard on Fox news, the temperature of the earth is rising not falling. Where have you been? - there is a greater mass of ocean water than air on Gaia. Loodt: I said: "showing the steady enthalpy increase in the ocean water column down well below where it was expected to be increasing by now." I may not have written that well (limit of 1000 characters). But it clearly says "enthalpy increase." The "ocean water column down..." was referring to the depth they can measure and the enthalpy continues UP. Thanks for pointing out something ambiguous - but I suspect that you might have been drinking something harder than spiked coolaid to come up with that interpretation. The enthalpy is going up. We are measuring it to greater depths. Is that clear or do I have to use smaller wrods? another fine piece of marxist propoganda. at least with agw in full meltdown mode you see fewer and fewer "scientists" publishing this crap. i imagine funding is starting to dry up a bit. you gotta love an agw cultists commitment to looking at bits of information in isolation, then making broad sweeping generalizations followed by end of days predictions of doooooooooooooooooooooom. the wheels are coming off the bus for these guys just in time. RJB26: Beautiful. Marxist am I? Let's see. I spent two years in Viet Nam. I served two tours as a civilian in Iraq. I have put my life on the line a number of times and have zero use for someone who calls me a Marxist on the 4th of July. So, I have just given you links to data and analyses that back up what I said before. Time for you to explain why I am a Marxist and back up your claim the wheels are coming of. well i wasnt talking about you per-se thermo, but since your taking it so personally(he doth protest too much! )ill address your weak defense of the afore mentioned marxist propoganda. before we get going i would like to point out john kerry was in viet nam too(as he likes to point out) and we see where his head is at on agw cultism. so while i thank you for your service to our country, i have to point out in the context of this conversation its absolutely meaningless as a defense of agw. good people can be convinced of all sorts of things and so ill put you in that category for now. now let me express my distrust of "scientific papers" as you put it, as if a paper bounced around in an echo chamber has any value whatsoever. agw "scientists" have stated as a goal that they want to get as many papers published in journals as possible so that they can cite each other. they have hijacked the peer review process. now that isnt a "peer reviewed scientific paper" and so you will invariably attack the messenger instead of addressing the message, so ill continue. how about some ice news. now again address the message and not the messenger. i know that unless a paper is written at berkley and published by an agw friendly institution you wont accept the conclusions therein and thats fine. as far as fluff goes lets delve into your sources for a moment. giss gets it wrong over and over again. faulty data, graphs that misrepresent, etc. i refer to it as marxist propaganda because agw cultists, like marxists wont be happy until we(the industrialized world) all live in mud huts and live off rice and soy patties. the sad part is there are plenty of useful idiots who will pitch in and help them fulfill this ideal.so while i once again thank you for your service, if that hits a little too close to home and you feel insulted-well, i think i can live with that. Continued: Your "sources" don't even go to recent temperature sites to see that 2010 is hot (in spite of snow in your back yard). And the e-mails you have dragged up are from 2001. Can't you do better than that? How about your idea that because someone is concerned about global warming they want you to "all live in mud huts and live off rice and soy patties." That is very scientific rhetoric. I suggest you take a look at the sites I showed you before that actually have recent data and then come back and (without sending me to Wattsupwiththis) actually add some science to your paranoid monologue about scientists pushing for the dark ages. Don't you see a little irony in that concept? You are saying scientists are lying about their results so that we can go back to mud huts where they cannot do science. I think you need to adjust your meds. The sun drives Earth's climate. But, it's a simple calculation to show that the temperature of Earth is much higher than would be expected by having a large hot body (Sun) sitting 1 AU away from a small, rocky body (Earth). The difference is caused by Earth having an atmosphere, which alters Earth's black body radiation. Regardless of the accuracy of temperature measurements, the science says that increases in CO2 will lead to increased surface temperatures. CO2 levels are increasing, and the combination of radionuclide levels and the decreasing amount of oxygen in the atmosphere says that it's caused by burning fossil fuels. I don't know the science that says how fast it *should* happen, but, if it's not already happening, it will. As for this research specifically... Albedo changes more at the poles. You go from white (high albedo) to brown or green (lower albedo). The Earth absorbs more heat from the Sun when the ice melts, and so heats up more, leading to more melting ice... Easy. nevdka: You are absolutely correct. However, you will, most likely, find that there are many, on this site, who do not understand physics and will immediately argue your points to show that the earth is actually cooling and that you do not understand the complexity of it all. It will be interesting to see how they come back to tell you that the physics is wrong. :-) Their imagination and lack of basic science always surprises me. Naturally, I agree with your view. nevdka: The Moon surface temperature sunward reaches about 242.33 degrees Fahrenheit without an atmosphere. As the earth is much cooler at the surface with an atmosphere, logically the more atmosphere the planet has the lower the temperature at the surface should be. Anybody who convinces themselves that an "Easy" description of the Earth's environment gives them deep insight into a fantastically complex system is only accomplishing self delusion. thermodynamics: name calling tells me you are not mature enough to engage in rational conversation. The Moon surface temperature sunward reaches about 242.33 degrees Fahrenheit without an atmosphere. As the earth is much cooler at the surface with an atmosphere, logically the more atmosphere the planet has the lower the temperature at the surface should be. Last night, my oven went up to about 400 degrees Fahrenheit. Obviously, the presence of potatoes causes increased temperatures, and any model that doesn't take that into account must be wrong. I try to base theories on scientific/physical principles, rather than observations. It's not enough to describe what's going on, but to understand why it's going on. At present, there is no known reason why the Earth should be getting colder, but there is a reason it should be getting warmer. Heh, that wasn't meant to be taken seriously, as evidenced by my ridiculous proposal as an example and the second statement about "Easy" descriptions that would only make sense if I wasn't being serious. I was also subtly making fun of thermodynamics, but I see that was completely missed as well. You implied that the temperature of the Moon's day lit surface with no atmosphere is utterly unrelated to the temperature of the Earth with an atmosphere (presence of potatoes and the temperature of your oven.) This is far from the case, do you know the succinct explanation? Then you imply that observational data is not part of scientific/physical principles. Then you state there are no known reason[sic] (which in context implies mechanisms) that could cause the Earth to cool. These are basic elements of a discussion of agw, I do not think you are well informed. nevdka: Welcome to the site where science takes a second seat to Rush Limbaugh and Fox news. Just don't let the Trolls drive you away. You will see them argue that the earth is cooling and that the ice on the earth is increasing. They will also tell you that CO2 is not concentrated enough to warm the earth. The list of their dogma is long and they depend on information from the news media and sites that depend on a conspiracy theory to make their claims seem sensible. It has been interesting when I give them links to the data that they choose to go for Fox news instead. Take a look back in this comments section and you can see they have no interest in primary data sources and quote web sites with advertisements from creationist sites. Insanescience: Since you seem to be very well read on your version of reality, let me ask a few questions. 1) Do you believe the Earth is warming? 2) Do you think that CO2 can have any role in warming the Earth (if you said yes to question 1)? 3) Do you think that humans have contributed to the build up of atmospheric CO2 (no matter how you answered question 1)? 4) Do you believe the Earth is cooling? 5) Do you believe there is a conspiracy by a large number of scientists to scare people into contributing to their AGW research? Just trying to see where you are coming from. You are welcome to ask me any question you would like and I will try to answer to the best of my ability. I missed so much on vacation. I guess nevdka isn't coming back. Anyway the succinct explanation as to why the Moon's surface is hotter than the Earths surface is that the suns energy is concentrated on the 2d surface of the moon but on Earth it spreads out over the 3D volume of the atmosphere. Plus the Moon doesn't have much of an atmosphere for convection to transporting heat away from the surface. I'm not the only person observing the drop off. "Oh, and it just happens that peat and coal are geologically related, since peat can turn into coal. It's common to find peat and coal nearby one another." "About 90% of the climate articles on this site are politically motivated with some agenda other than science."